This page discusses the infrared sky background on Mauna Kea and Cerro Pachon. Files of sky emission spectra for the two sites are available at the bottom of the page. The near-IR (1-2.5µm) sky background is dominated by many intrinsically narrow hydroxyl (OH) emission lines. A few other species (e.g. molecular oxygen at 1.27µm) also contribute, as do H2O lines at the long wavelength end of the K window. During the night the hydroxyl lines vary in brightness on a timescale of 5-15 minutes and with an amplitude of 5-10% as atmospheric wave phenomena change the local density of species. As the emission occurs via a radiative cascade, all of the lines vary together in brightness to first order. The strength of the OH lines also exhibits a steady decline for the first 1-2 hrs after sunset. Spectroscopic observations at low and intermediate resolutions are usually not advisable during twilight, especially in the J and H bands, as it can be difficult to achieve accurate sky subtraction. Imaging observations of bright objects are possible, albeit with an increased and varying background. The IR Integration Time Calculators employ model high resolution sky emission spectra, an example of which is shown below. In addition to the OH lines, the models incorporate zodiacal continuum emission (approximated by a 5800K black body) (each then scaled by the atmospheric transmission), and thermal emission from the atmosphere (treated as a 273K black body for Mauna Kea and a 280 K blackbody for Cerro Pachon multiplied by 1 - transmission), at a variety of airmasses and water vapor columns. Note that moonlight, which is not included can be the dominant background source (e.g., much more so than in the model spectra), especially in the J band when the moon is bright and especially when the target is close to the moon. For information about how the airglow at Maunakea affects the broadband Sky Background (at Gemini North in the J, H, K, and other windows) as a function of the time of the night, the Moon, the airmass or the season, see the page about Measurements of airglow on Maunakea (will open a new page from the GMOS instrument). The near-IR (3-5µm) sky background is due primarily to thermal emission from the atmosphere. The transmission (and therefore the emission) varies with atmospheric water vapour content and air mass. See the descriptions of atmospheric transmission and the adopted water vapour conditions for more information. An example model background spectrum, smoothed to a resolution of 2cm-1, is shown below. The mid-IR (7-25µm) sky background behaves similarly to the 3-5µm background, but is much more intense. See the descriptions of atmospheric transmission and the adopted water vapour conditions for more information. The sky background has been modeled for Cerro Pachon as well and is used in its ITCs. Data files are similar to those for Mauna Kea. Raw sky emission data files 0.9-5.6 and 7-26 microns for both Mauna Kea and Cerro Pachon are available in ascii format via the following tables. These files are sky background only; they do not include the emission from the telescope itself and from the instrument (both of which are included in the IR Integration Time Calculators). The files were manufactured starting from the sky transmission files generated by ATRAN (Lord, S. D., 1992, NASA Technical Memorandum 103957). These files were subtracted from unity to give an emissivity and then multiplied by a blackbody function of temperature 273 for Mauna Kea and 280 for Cerro Pachon. 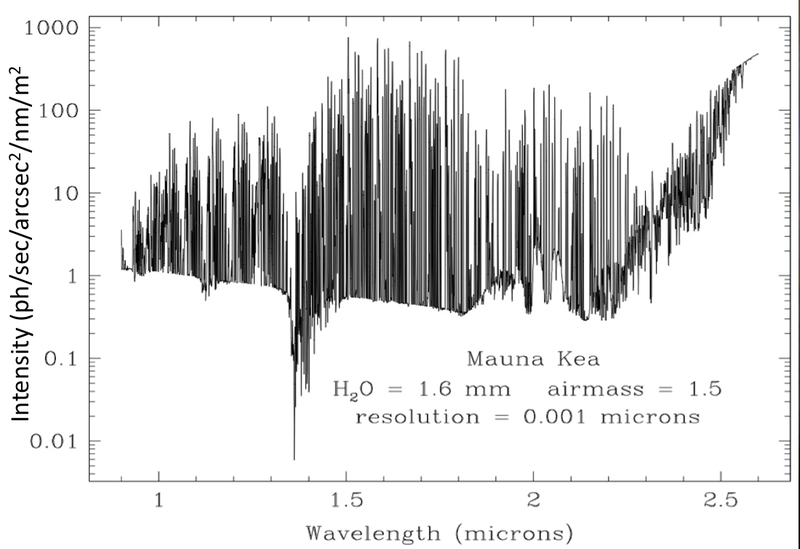 To these were added the OH emission spectrum (available from the European Southern Observatory's ISAAC web pages) a set of O2 lines near 1.3 microns with estimated strengths based on observations at Mauna Kea, and the dark sky continuum (in part zodiacal light), approximated as a 5800K gray body times the atmospheric transmission and scaled to produce 18.2 mag/arcsec^2 in the H band, as observed on Mauna Kea by Maihara et al. (1993 PASP, 105, 940). Any use of the data in these tables should reference Lord (1992) and acknowledge Gemini Observatory. The 1-5 micron models are in ASCII two-column format: (a) wavelength with a sampling of 0.00002µm and a resolution of 0.0004µm (0.04nm) and (b) emission in ph/sec/arcsec^2/nm/m^2 . The 7-26 micron models have a sampling of 0.0001µm and a resolution of 0.0002µm (0.2nm) for Mauna Kea and 0.002µm and 0.004µm (4nm) for Cerro Pachon. (In most browsers, hold down the shift key when clicking to save the data to a file). The numbers in the titles of the files are 10X the water vapor in mm and 10X the airmass.